Connie Hagar, the "Texas bird lady", Aransas County. Photo courtesy of Alfred Eisenstaedt. Image available on the Internet and included in accordance with Title 17 U.S.C. Section 107. HAGAR, CONGER NEBLETT (1886–1973). 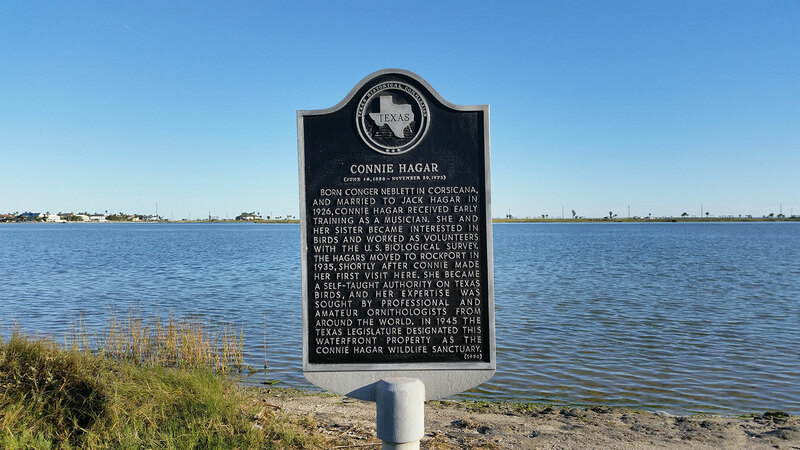 Conger (Connie) Neblett Hagar, the "Texas bird lady," daughter of Robert S. and Mattie (Yeager) Neblett, was born in Corsicana, Texas, on June 14, 1886. She graduated from Corsicana High School in 1903, studied voice and piano at Forest Park College in Saint Louis, and took postgraduate music training at the University of Chicago and the American Conservatory. Although offered employment as a professional singer, she declined, believing such a pursuit improper. After World War I she became a bird bander for the United States Biological Survey. She was married briefly to a naval officer, but the marriage was dissolved in 1921. In April 1926 she married Jack Hagar, a Bostonian who had come to Texas because of his interests in oil and real estate. The couple had no children. In 1935 the Hagars moved to Rockport. Connie Hagar spent the rest of her life as an amateur bird-watcher in Rockport and gained the respect of professional ornithologists in Europe and the United States. She added over twenty new species to the avifauna list of the state and was the first to report numerous species of migratory birds, including several that were thought to be extinct. In addition to the snowy plover, buff-breasted sandpiper, ash-throated flycatcher, and mountain plover, she identified nine different species of hummingbird; the annual movement of these birds down the Texas coast had been unobserved until she discovered it. She reported more than 500 bird species in the Aransas Bay area, nearly three-fourths of all the bird species known between Canada and Mexico. Connie Hagar's historical marker, in the Connie Hagar wildlife sanctuary. Image available on the Internet and included in accordance with Title 17 U.S.C. Section 107. Throughout her life Mrs. Hagar was a conservationist, teacher, and tireless bird-watcher. She spoke to numerous schoolchildren, garden clubs, and other groups and kept detailed notebooks. Her observations were published in several ornithological journals, and her work brought amateur and professional birders to the Gulf Coast from throughout the world. Perhaps because of her diminutive size-she was under five feet tall-and the fact that she regularly wore starched linen to go birding, photographer Alfred Eisenstaedt complained that she did not look like a bird-watcher when he photographed her for Life magazine in 1956. Mrs. Hagar played the organ regularly for the Aransas Pass Christian Science Church, but she was not a member of that or any other church; she claimed to prefer nature's sermons to man's. She was a member of the Rockport Women's Club, the Texas Federation of Women's Clubs, the Texas Ornithological Society, and the American Ornithologists' Union. She received a special citation in 1962 from the National Audubon Society, which convened in Corpus Christi that year largely to be near Rockport's flyways and to allow the seventy-six-year-old "bird lady" to attend. Connie Hagar died on November 24, 1973, in Corpus Christi, after two years of hospitalization and blindness. She was buried at Rockport Cemetery, in a spot overlooking the bayfront named Conger Hagar Wildlife Sanctuary. Eleanor Anthony King, "Lady with Binoculars," Audubon, July 1947. Karen Harden McCracken, "The Bird Lady of Texas (1886–1973)," Birding, March-April 1976. Karen Harden McCracken, Connie Hagar: The Life History of a Texas Birdwatcher (College Station: Texas A&M University Press, 1986). Edwin Way Teale, Wandering Through Winter (New York: Dodd, Mead, 1966). Fred D. Thompson, "Bird Festival at Rockport," Texas Game and Fish, August 1950. Handbook of Texas Online, Karen Harden McCracken, "HAGAR, CONGER NEBLETT," accessed April 26, 2019, http://www.tshaonline.org/handbook/online/articles/fha07.